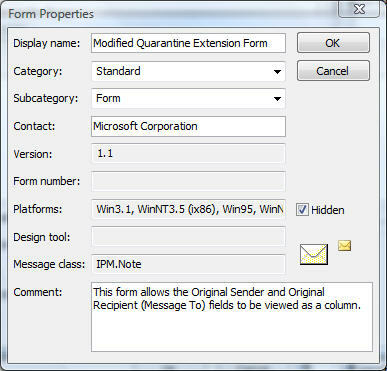 “How to Recover Quarantined Messages from the Spam Quarantine Mailbox” in the Exchange Server 2007 documentation shows how to use a custom Outlook form to expose the original sender – the doc has code that can be copied to a text editor like Notepad and saved as a custom form (QTNE.CFG), which can be used in Outlook to expose the relevant MAPI property as a field that can be added to the view. This exposes the original sender, but doesn’t expose the original recipient of the message. To expose the recipient, you need to modify the form from the above link and add the relevant MAPI properties. Download the modified form file and save it in the correct Forms folder for your locale. For US English, the path is: \Program Files\Microsoft Office\Office12\Forms\1033. You can find out the locale ID (LCID) for your locale from KB 221435: List of supported locale identifiers in Word..
1. Tools | Options | Other tab | Advanced Options | Custom Forms | Manage Forms | Install. 2. Navigate to the path where you saved the QTNE.CFG file, and select the file. 3. Click OK a few times till all the dialog boxes are closed. The form is now installed. With the form installed in Outlook, it’s time to make the fields show up! 1. 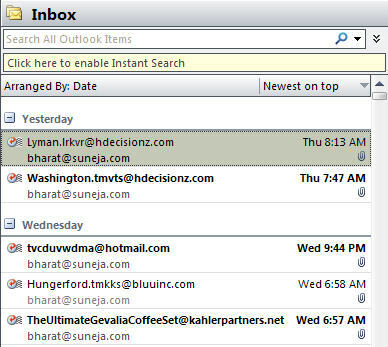 In the Outlook messages pane, right-click the column heading on the top | select Custom. 2. In the Custom View dialog box, click Fields | from the “Select available fields from:” drop-down (which says “Frequently-used fields” by default), select Forms [screenshot]. 4. 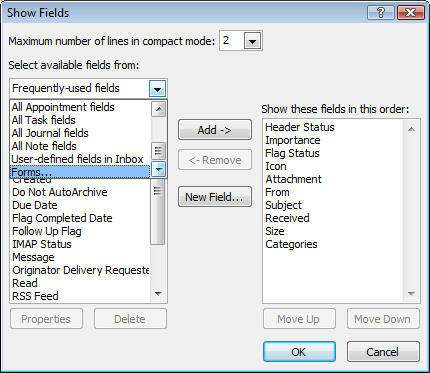 In the Show Fields dialog box, select Original Sender and Original Recipient | click Add. 5. Additionally, you can remove unnecessary fields and order the fields the way you want [screenshot of fields I have selected]. When the message list pane is expanded in Outlook, this is what it looks like. 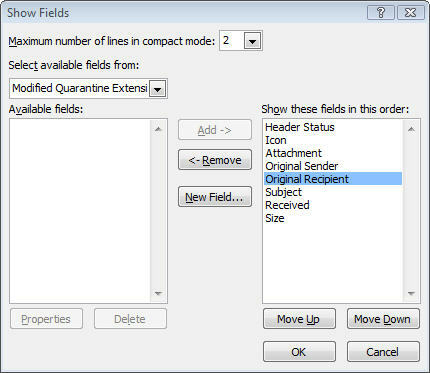 Exposing these fields makes managing the quarantine mailbox easier. Exchange 2007 SP1 also exposes the original SCL. The Outlook form file (QTNE.cfg) can be updated by adding the following. You can download the updated QTNE.cfg form or manually updated your own file. Now you can add the Original SCL column. 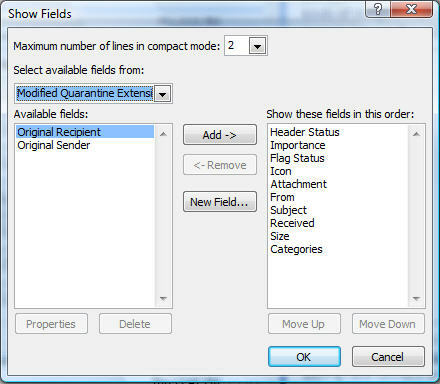 Figure 6: The original SCL for messages in the quarantine mailbox can be displayed using the updated Outlook form. evious version of QTNE.cfg is still available. and what about exposing the SCL rating ? This way it makes it easier to fine tune the filter. But now, you can’t see what was the SCL rating of the message being quarantined. Only after delivering to the original sender, you can see the SCL rating in the message headers. I would like to see them in the quarantine mailbox. 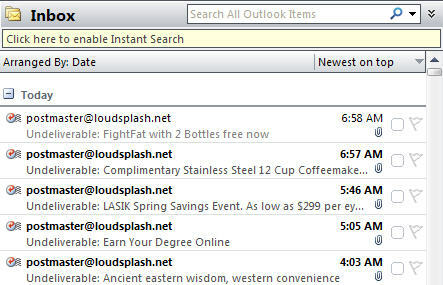 Can we expose the original senders and recipients at the outlook web access? @franc: The post has been updated to include original SCLs. This was exposed in SP1. @anonymous: Thanks for reporting— it was a permissions issue. Is the any way to do kinda the same for the Subject line – a client we have does not want the “Undeliverable:” part to be displayed i Outlook when browsing the Anti-SPAM mailbox. I’m thinking like picking up on “OriginalSubject” or something? just the feature i was looking for. thanks for posting this howto. This is important and should be included in the help files of exchane like the originalsender is. Unless I missed it, they stopped at that and left out SCL. I have downloaded the QTNE.CFG file and the option to show the original recipient is not there. I double checked the code. Also, I am having the issue of not being to see the original SCL. Thanks, great post and very useful. This is amazing !! a Real Blast !! -Original Sender, TO, Original SCL ! everything i needed! It was Very difficult to find it in internet as a lot of posts concerns Outlook2003. I do not where you live but i own you a few beers! 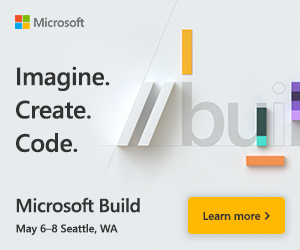 Ps: This should be hard coded in Outlook !!!!! Thats great!!! Thanks alot, you rock! Now how can I display in a Column the Internet header Sender: field. The one that will put in the From as "Username on behalf of Group mailbox"
I am trying to find this PR value but still can not find it. Is there a database of PR values we can find somewhere? Is this supposed to work for Exchange 2010 and Outlook 2007 ? I am not seeing any values in the SCL column. we habe configured our display the fields Original Sender and Original Recipient. Now we try to display the field ReplyTo, can you please help us with the values? I haven’t looked at behavior in the current versions in a long time – the post is more than 10 years old.